Galaxies bound together by gravity - Solar System Planets And Moons Section. 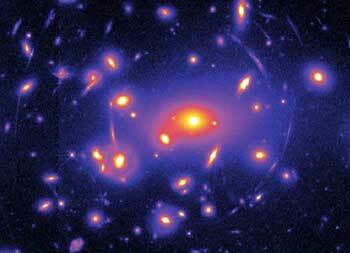 These clusters contain hundreds of Galaxies bound together by gravity. hundreds of Galaxies bound together by gravity. Happy New Year fellow sky watchers! The New Year gives everyone a chance to make plans, resolve themselves to new and better habits and the hope that the New Year will be a good one. January also offers stargazers a chance to plan a years worth of observing. For some this may seem like a daunting task. Many observers, particularly those new to amateur astronomy, still ask "what should I look for, what will I see?" It is in the spirit of this question that I offer a year long "to-do list" for back yard astronomy. It is by no means an exhaustive list, but it might get you out the door and lead you to many other discoveries. The list is a mixture of upcoming events and small, at home projects that require no special equipment, just a healthy curiosity. Robotic Hubble Space Telescope Servicing Contract Awarded. NASA has given a Canadian firm the green light to begin developing a robotic salvage mission that could repair and upgrade the aging Hubble Space Telescope. The agency awarded a $154 million contract to Canada-based MacDonald, Dettwiler and Associates. This is the same firm that developed the Canadarm, and contributed to the Mobile Servicing System on the International Space Station. MDA's solution is called Dextre: a two-armed robot that could perform all of the same maintenance tasks that had originally been designed for human astronauts. The move towards a robotic solution is still controversial, and NASA hasn't made the final decision on what to do with Hubble yet. Swift Sees gamma ray Bursts Right Away. NASA's Swift observatory is only in the initial testing period, and it's already finding massive gamma ray bursts. scientists were calibrating the telescope when it recorded a burst on December 17, three on the 19th and then one on the 20th. The team was hoping they'd see 2 bursts a week, so this greatly exceeds expectations. It could be that they were lucky, or they underestimated how often these explosions occur. The Swift team also tested the observatory's instruments by pointing it at Cygnus X-1; a well-known object that produces a signficant amount of gamma rays. Biggest Eruption in the Universe. Astronomers have used the Chandra X-Ray Observatory to watch the most powerful eruption ever seen in the Universe. The eruption is coming from the heart of a distant Galaxy cluster called MS 0735.6+7421; it's been going on for more than 100 million years, and generated the equivalent energy of hundreds of millions of gamma-ray bursts. Astronomers believe that this energy is being released because a supermassive black hole has sucked in more matter than it can consume - the mass of 300 million Suns is being swallowed - and this excess is generating tremendous heat as it backs up.